Dave doing two of his favorite activities – retiring and eating – at Portsmouth Homecoming 2014. 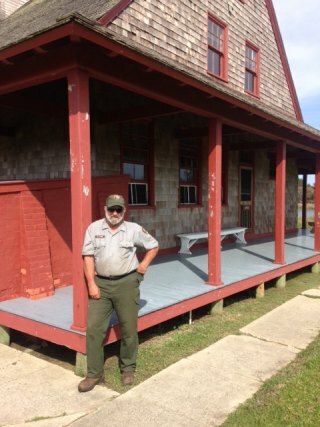 On Tuesday, May 23rd, Dave Frum took his last trip to Portsmouth as its official handyman extraordinaire, marking the end of 28 years of work on the island, and 43 years in the National Park Service. When I talked to him on the 25th we were sitting in his office at the water plant, where he has also worked since 1992. Now enjoying “partial retirement” he only works four days a week instead of six, but he found time in his still-busy schedule to talk a little bit about the adventure that brought him finally and improbably to Portsmouth. Dave’s long relationship with the NPS started in the summer after his junior year of college in 1973 working as a seasonal generalist ranger at Mammoth Cave National Park in Kentucky, a job which he came back to the next two summers as well. 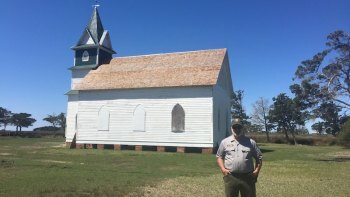 In ’76 he got a permanent job at Abraham Lincoln Birthplace National Historical Park, which in addition to being a mouthful, is also home to the log cabin that President Lincoln was allegedly born in. Fun bit of trivia here—the cabin was taken on tour around the US in the 1860s and finally brought back to Kentucky where a marble monument was built around it. During this time Dave had a friend who was talking about transferring to Cape Hatteras National Seashore, and Dave remembers saying something along the lines of, “Who wants to be in New England?” But when he heard that the Outer Banks were in fact in North Carolina he was intrigued enough to come and visit. He loved Ocracoke from the very beginning, and when his application for transfer was accepted in 1977, he moved to the island. Two years into their marriage Dave and Karen decided to go on a year-long tour of the country. Dave had been passed over for promotion multiple times in the Park Service, and he was getting frustrated, and both he and Karen loved traveling (they had talked about it on their first date), so after six years on Ocracoke he quit his job at NPS, they packed into a truck with a camper on the back, and took off for the west coast. What was supposed to be a one year trip turned into a three year odyssey. Nine months into their voyage Karen and Dave found themselves in the Pacific Northwest and out of money, so Dave took a job at Olympic National Park (starting to see a trend here?) for about 5 months. The two lived in a house on Lake Crescent, which Dave says was a nice break from nine months on the road in a tiny camper. That was in 1984, and the next two years were the only ones between 1973 and 2017 that Dave didn’t hold at least a temporary position with the Park Service. The nationwide tour continued through ’85 although they got snowed into Colorado and hung out at Crested Butte working whatever jobs they could find. 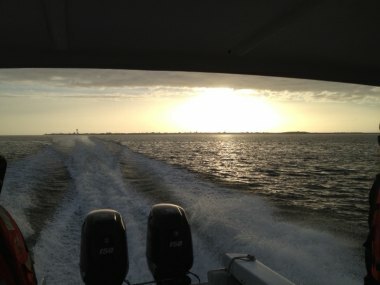 That spring, “missing salt water like crazy,” they worked their way to Padre Island, near Galveston Texas. Although Padre Island is a National Seashore, Dave didn’t apply for a job there. Instead, they hung out for a week trying to decide on the next move: should they head back east and homeward? Or had they not yet gotten their fill of what the open road had to offer? Then word reached them of Timberline Trails, in Tincup, Colorado, a camp for children with learning disabilities, which was perfect for Karen, who had previously held (and would hold again) the position of special education teacher at Ocracoke School. So back west they went again, “we made it as far east as the Mississippi, then turned around,” and once in Colorado, they gathered up a group of kids and did a two-week tour of National Parks within the radius of the camp. Towards the end of the summer, and about 30 months into the year-long trip, Dave and Karen headed back east to spend the fall and Thanksgiving in New York with Karen’s Family. By this time they had seen somewhere between two hundred and two hundred and fifty National Parks and Monuments. The following spring when they returned to Ocracoke, “to complete the cycle,” and show all their friends that they had really made it all the way out and all the way back, Karen’s previous position at Ocracoke School had come open again and she was asked to stay by Principal Cutler. “That wasn’t in our plans at all,” Dave says of the offer to stay on Ocracoke, but they agreed to do it and Dave started looking for jobs on the island. The next summer (’87), Dave got a job on Portsmouth Island, working and living there four days a week, as part of a maintenance and generalist crew. 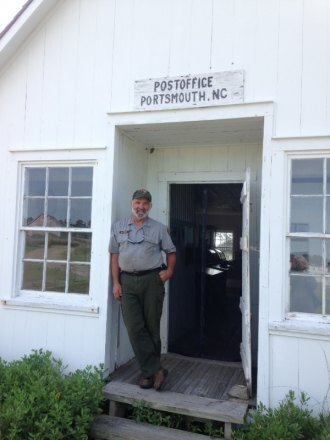 He lived in the life-saving station, with very few amenities, and had to check in and out for the week at the Cape Lookout National Seashore HQ in Beaufort every Tuesday and Friday. 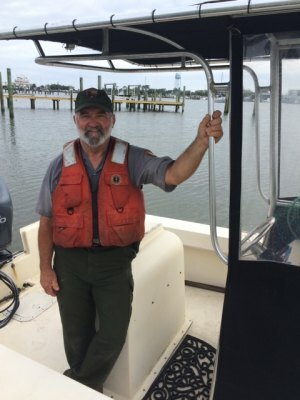 “I loved the work,” Dave says, “but I told them I would only work another season if I could go back and forth from Ocracoke each day.” At that time the Park Service couldn’t get approval for that way of doing things and so after his first summer on Portsmouth, Dave was once again looking for work. 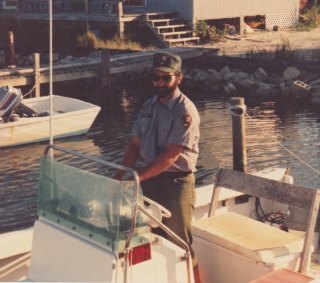 Luckily around that time—Winter of ’88 through 1990— NPS was doing a major restoration of the Ocracoke Lighthouse and the Lightkeeper’s Cottage, and Dave got on the crew. This was a busy time, as Karen and Dave had also recently bought their house, and he was working on jacking it up off the ground, installing new pilings for it to sit on, and generally fixing it up. When he would finish for the day over at the lighthouse, he would take the five minute walk back to his own yard to catch his breath and then start right in on home improvement. During the course of the lighthouse restoration, another big change came along: their first daughter, Emma! Dave says that when Emma born, “it began to get serious, I needed a real kind of job,” but the work on the lighthouse was finished, and when the same restoration crew tried to send him to Bodie Island, “we had a little disagreement,” and, as he puts it, “well, I quit.” Dave didn’t want to spend every day going all the way to Bodie Island, especially now that he had a baby in the house. 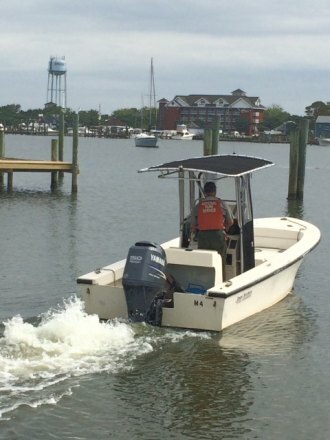 In the meantime the management at Cape Lookout had been doing some re-evaluation, and had come to the conclusion that it would actually be very helpful to have someone come over from Ocracoke on a daily basis, and when they asked Dave if he would still be interested he was thrilled to take the job. His first season was the summer of 1991, and he would go on to work 27 more seasons, eventually working a 3-day-a-week, year-round job beginning in 1994. In the winter of 1991 the Ocracoke Sanitary District Water Plant was hiring, and Dave got the job, working three days a week there as well. Since then he has split his time between making the best water in North Carolina, being a one-man maintenance/interp/law enforcement team at Portsmouth, and defending the title of Funniest Frumjoy—(I hear young Addie is making a strong bid). Young Dave or young Fidel? Dave is happy to be retiring, but he will miss working on Portsmouth, “seeing a project that needs to be done and jumping to it,” even though (by his own report) he’s too old to be climbing up on roofs. However, the Frumjoy legacy with the Park Service continues with Dave’s second daughter Molly, who took a seasonal job last summer and again this year at Wolftrap National Park for Performing Arts, a continuation that Dave is very proud of. When I asked him what he will do in his time off, he laughed and said, “maybe go to the beach for once!” He also plans to spend more time visiting his granddaughter Adelaide in Asheville, and enjoying the parts of Ocracoke that he’s been too busy to for so long. If you see him around, you should thank Dave for his years of service to the National Parks, and for making your water drinkable and delicious, and if you’ve got the time to chat, I can guarantee you that you’ll learn some fascinating new piece of knowledge from one of his many areas of expertise! 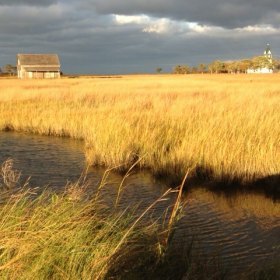 To learn more about Portsmouth Island, start here and here and here. To go there yourself, go with the Austins on their Portsmouth Island Boat Tours.